After last month’s ice cream bonanza, I thought I might make something a bit more savory. 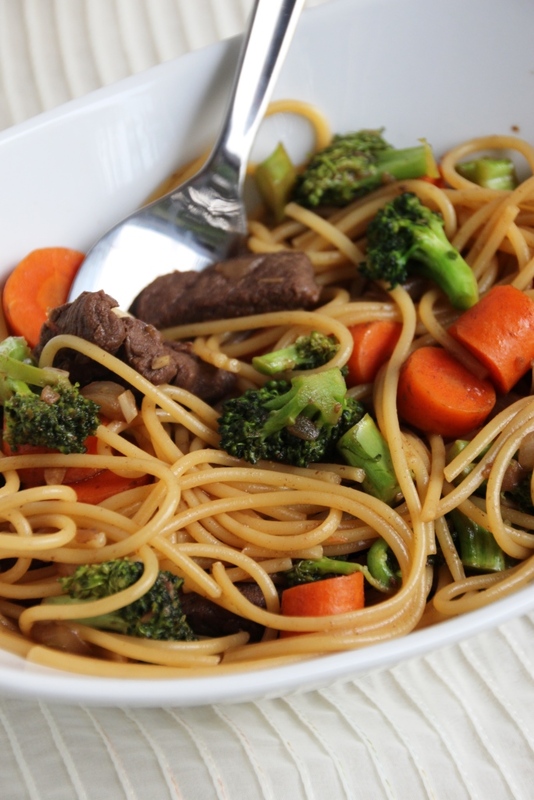 I came across this lo mein recipe on Pinterest and liked how easy it looked. I also liked that it doesn’t really require side dishes since it already includes veggies, grains, and meat. Timing different things to all finish at the same time is my least favorite part of cooking, and the main reason I prefer making desserts over dinner. Okay, that might be a stretch, but it is a pretty big reason nonetheless. I prepped ahead of time by cutting all the veggies and the meat, and this saved a lot of time when I made it the following night. Putting it together took less than thirty minutes which makes it a great weeknight dinner if you have a little bit of time the night before to cut some veggies. It is still a pretty quick meal even without the prepping, especially if you’re better at cutting things than I am. If you’re looking for an easy recipe to dip your toes into the waters of Asian entrées, this is a great one to start with. 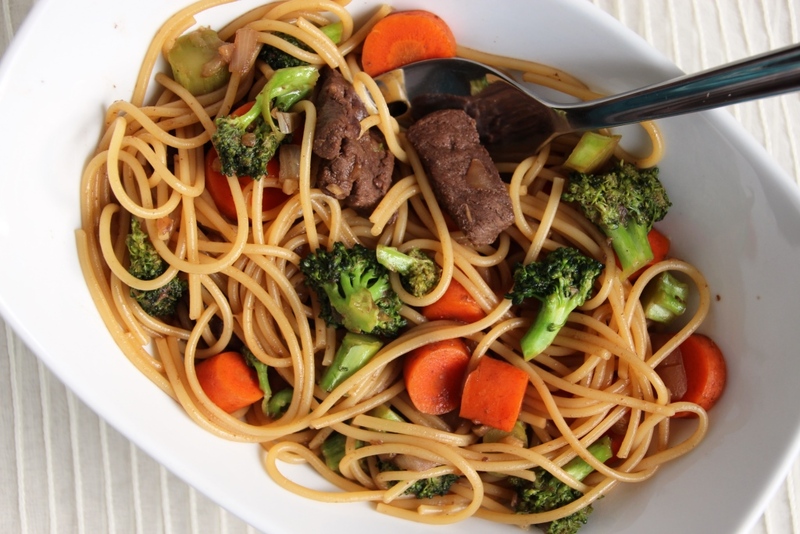 Mince the garlic, and cut the meat and remaining veggies into bite-sized pieces. Slicing them thinner than I did will help everything to cook more evenly. Pro tip: meat is easier to slice when it is still slightly frozen. If prepping ahead of time, store in the fridge until ready to cook. Bring water to boiling (scoop out 1/4 cup for your sauce) and cook pasta as directed. Drain and set aside. Add bouillon cube to boiling water and stir until dissolved. Add soy sauce, sugar, and sesame oil and whisk to combine. Set aside. Meanwhile, in a large frying pan or wok, sauté oil, garlic, and onion for 2-3 minutes. Add meat and fry until it’s lightly browned. Add remaining veggies and fry for another few minutes until veggies are cooked but still crisp. 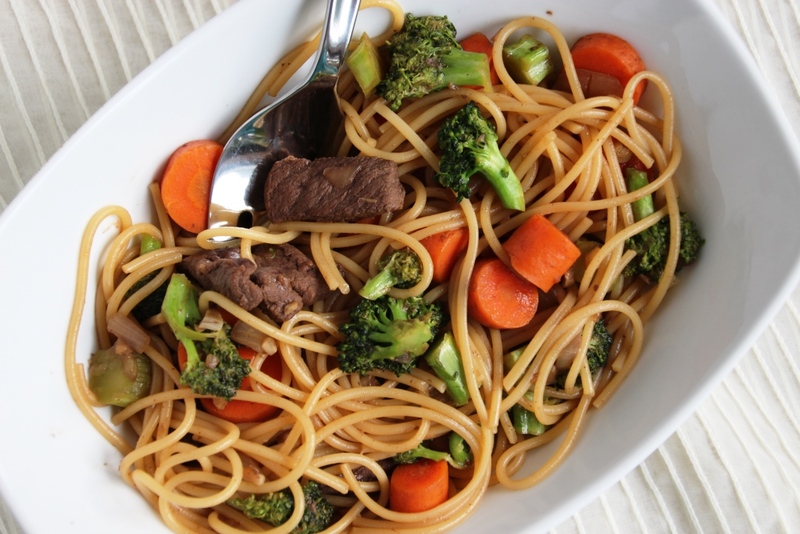 Add sauce and noodles, mix thoroughly, and cook briefly to ensure all ingredients are warmed through.